HOW CAN I HELP YOU - Langhus Lukka Horse tours and Finding your dream horse. The group of sale prospects in our area is so big and changes fast, so we just have a handful of horses on the saleslist on our page. So, you might see an interesting prospect here on the website. If not, we might know about your dream horse, several that are prospects, or, given a bit of time, we will usually find it. How can we help you with your dream horse, how can we be of service? There is a comfortable and affordable guesthouse very centrally in our area, Skagafjörður. It fits perfectly if you come to us to stay for maybe 2-3 days to find your dream horse, because then we can go to dozens of farms in the neighborhood. This guesthouse that has been giving my customers/guests a good home for the days they spend here is Mikligarður. In the neighborhood, at Sauðárkrókur and more places in Skagafjörður, there are also all sorts of accommodation offered, both summer houses, a 4 star hotel, small guesthouses in villages or on farms, and more. We have a list of accommodation options in the area. When a horse has been bought, there can be various reasons for the buyer wanting the horse to stay in Iceland for a longer time. We are in cooperation with good farms that can take excellent care of your horse, raise your youngster, board your stallion, etc. When a mare has been bought, there is often interest in breeding her and exporting her in foal with one of the great stallions that are in Iceland. It can be a once-in-a-lifetime chance to bring their genes into your stock, and the prices for stud fees are probably a lot lower than in your country. We can take care of having the mare bred, having a veterinarian ultrasound the mare etc. When a mare has been bought, there can be various reasons for wishing to have her evaluated before she departs. We can help you arrange for the mare being trained and shown by excellent trainers. Lukka has travelled a lot to give clinics. We are also in contact with very good, certified riding teachers, that can come to your area and hold a clinic or give riding lessons. You can also come to Iceland, and take riding lessons, join a clinic, or have a clinic custom made for you or your croup, by a certified riding teacher. We are in cooperation with excellent exporters that specialize in taking care of transporting and exporting horses. We and the exporter take care of the whole process of the export. F.ex. veterinary checking the horse, transporting the horse to the Reykjavik/Keflavik international airport, paperwork, flight, quarantine (applies to USA, there is no quarantine to Europe), etc. The buyer just has to take care of paying for the horse, paying for the export, and having the horse fetched at the destination airport. We can also help out finding a domestic transport in the other country, if nessesary. For updated information on prices, the export process, destination etc., feel free to send us an e-mail. 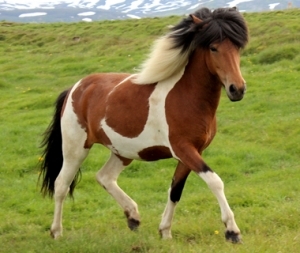 Importing a horse from Iceland is incredibly easy. You can take a holiday combined with finding your dream horse, and travel around in our area or in bigger parts of Iceland. We can help you plan and get ideas, depending on your wishes. For various reason, you might want your horse trained more. We train, of course, but are also in contact with many excellent trainers, both great show trainers, and patient trainers that take care to prepare an excellent family horse, others that are interested in dressage, teaching a youngster basic handling etc. so that your horse is prepared in the best way to be your dream horse. Tours and rides on horseback. We do horse tours, and you can join us on a shorter or longer horse tour, from 2 hours to several days, for example if you want to combine such a fun experience with finding your dream horse. There can be several reasons for you wanting your horse transported to another part of the country (breeding to a certain stallion being a common reason), and we can do that or arrange for that being done. In short…How can we be of service?